Part One of my new Folder Icon Series! hello HDavisPl....great looking stuff! 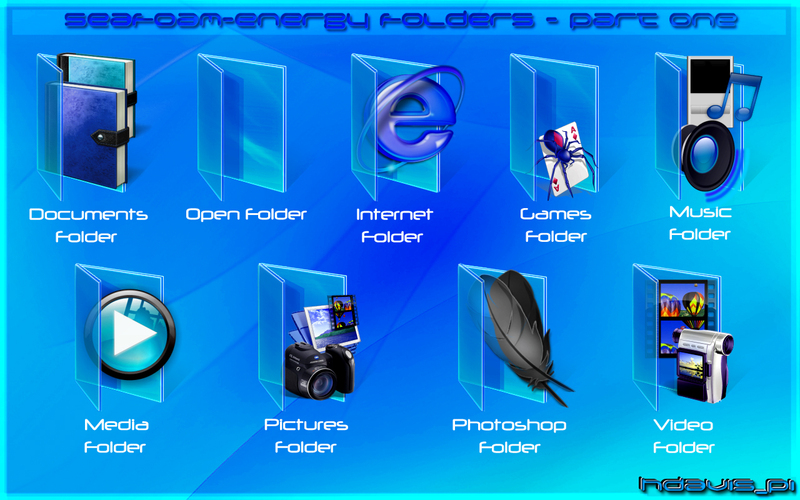 The only problem i see is that your media folder is using an icon by Bohemy. I dont think that would be a problem but before you go any further i would contact him and ask for his permission......other than that I think your looking real good. Thanks for the comment and the input, Skinhit; however, I used the .png file "MYOB" by guiwerx, which is located here http://www.wincustomize.com/skins.aspx?skinid=12776&libid=29 to create that media player icon.... but I do concede that the two are very, very similar (almost identical). If you check out the above-referenced file, you'll see that the overlay is almost a perfect match. If any issues rear up in the near future, I'll gladly address them at that time. Thanks again! I really do appreciate it! No problem, just let me know either way if it's not too much trouble... wouldn't want to step on anyone's toes, savvy? First of all, I want to point out that I used what I thought was an original png asset by guiwerx (have you seen it?) At the time, I didn't even know of your WMP icon, I only learned of it last night via skinhit's comments; regardless, no ripping of your work on my behalf was intentional and I apologize if that's what you were thinking. Also, I appreciate you giving your consent, but I think I'll just create a a different media folder and upload a new set to replace this one in order to conclude this controversy once and for all. OK,it's fine, no harm done.BTW I think that icon fits well there, isn't it? And I like that folders of yours. Sweet... and yeah, it looks pretty damn good! Very Nice, HDavisPI! Well done. My only objection in this series id the Internet. I think it should be a stand-alone icon with out the blue folder around it. Other than that, it's an awsome start to a series. Nice set. The Blues in it are awesome.